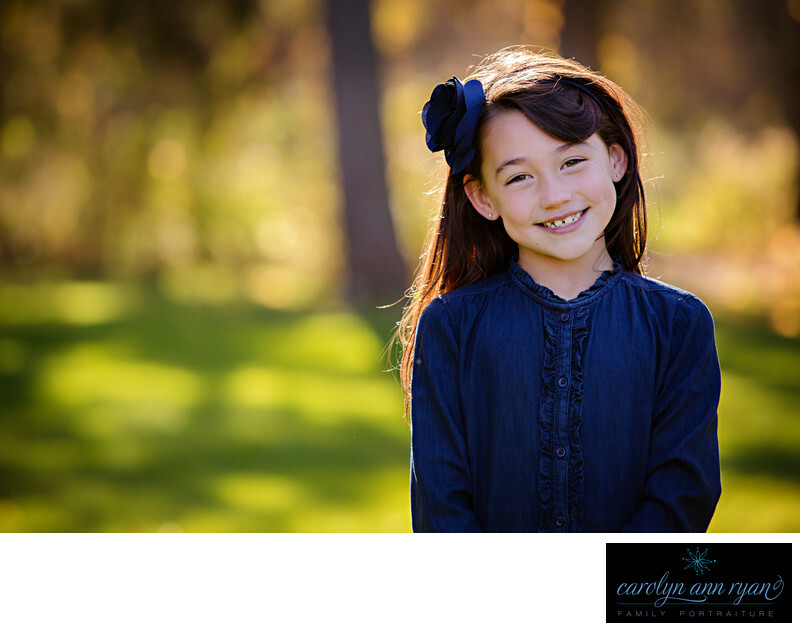 Autumn is the perfect backdrop for Family Portraits and this particular day was no exception, and one was definitely one of my favorite portrait sessions of the 2014 Fall Portrait Session Season, but it wasn't just the beautiful Fall Foliage backdrop that I loved. I love the family's styling for the session, which included this beautiful girl in a denim blouse with a red skirt, red shoes and a blue headband with a flower on the side. Mom had a navy blue dress, while Dad and big brother both wore button down shirts with navy and plaid. Just a few frames before this particular portrait, I photographed this sweet girl doing cartwheels in the grass, and Mom mentioned how happy that would make her daughter. We did a few rounds of the cartwheel photographs, so I have a great series of the images in succesion, but what do you get moments after photographing a girl doing cartwheels. You get a beautiful happy smile and the perfect portrait from that same girl, because you just absolutely made her day! It's all about having fun and keeping kids happy and engaged and helping to ensure that everyone is enjoying themselves during the portrait session. When the kids are happy, the parents are happy and my job just gets easier. The photographs of this beautiful family remain some of my favorites today.Keywords: Autumn (117), blue (138), Fall (129), foliage (33), girls (165), Navy (51), timeless (54). 1/250; f/4.0; ISO 250; 180.0 mm.